Artmen Falate (23) is one of the recipients of the theater training by Manila-based PETA hosted by Pasali in 2008. He became part of Teatro Kawagib. ‘Kawagib’ means ‘right’. 3) portray wholesome social values. The group is unique in General Santos City, being the only Tri-people youth group that dramatizes negative conditions of CICL, child abuse, labor, discrimination, trafficking, gangs. 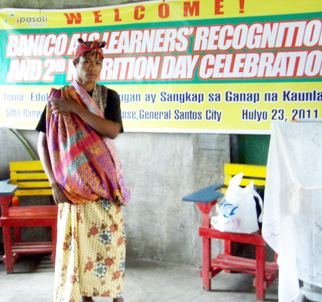 Their audiences in General Santos, Sarangani, and Sultan Kudarat are villages and city dwellers, businesses, religious groups, social & health providers, teachers, police, government & law makers. They are present at community events, perform at Pasali gatherings and volunteer for activities. Audiences have been known to shed tears of sadness and joy, moved by their raw, explosive talents. It organizes its own funds for its costumes and travel expenses, deftly juggling competition prize money fundraising and expense compensation from businesses and non-profit who request them. They are an example of Pasali’s operation of local partnership, fostering sustainability.